Joseph Bottari was born in the Iron Bound section of Newark, New Jersey in 1981. Elements as diverse as growing up fishing the elusive waters of Florida Bay to understanding the key elements in Modern and structural engineering have strongly influenced Joseph towards the direction of illusion and manipulation of his mediums. Bottari graduated as validictorian from welding and drafting school in Linden, NJ to become a master welder in aeronautics in under a year. In 2008 Joseph was forced to open up a different creative avenue and leave welding behind due to knee surgery as a result of complications from a life of skateboarding. Much like skateboarding and welding have taught him about dedication and consistency, Joseph decided to pursue the arts full time, turning towards the disciplined teachings of Berlin’s Bauhaus and the artists of Post Modern Op Art thus shifting his style by mashing both Op illusion and Neo-dada together. 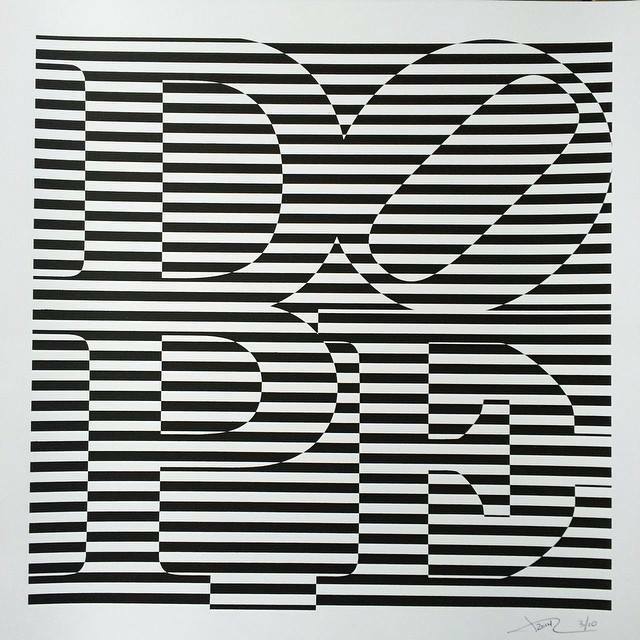 Joseph Bottari’s DOPE series is currently represented by both Guy Hepner Gallery and Dorian Grey Gallery. Influences are: Elsworth Kelly, Gerhard Richter, Tom Wesselmann, Rauschenberg, Patrick Nagel, Richard Serra, Robert Indiana, Bridget Riley, Frank Stella, Paul McCarthy, Bruce Nauman and the movements of Free jazz & 60-70’s Psychedelic Rock. Joseph holds the largest Crayola full color Spectrum work on canvas to date. ‘The Experimental Project: Suspension’ is comprised of 1,800 Crayola Crayons. Dimension: 78 x 192″, 2012. Guy Hepner Contemporary Art Gallery In New York City is pleased to present artist Joseph Bottari artwork, paintings, prints, art for sale. Inquire about prices to buy Joseph Bottari art.